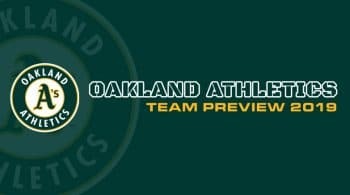 The Oakland A’s have a fun bunch, and are built with a lot of power. They will miss Jed Lowrie, but adding Jurickson Profar wasn’t a bad move. He gives them some middle of the lineup pop and speed. The big power bats are Matt Chapman, Matt Olson, and Khris Davis. Oakland added Robbie Grossman and Nick Hundley to serve as regulars, and while they are not household names, they should fit in nicely. Stephen Piscotty bounced back with a strong year in the power department, and adds to a pretty strong 2-6 lineup. At home this team struggled last season, but were a top five offense on the road. A lot has to do with the ballpark they play in. Keep note of that if you are playing fantasy. Otherwise this team should be fun to watch again. Oakland’s rotation is not in a good spot heading into the season, and the chance of recreating a 90+ win season from last year is going to be tough. Sean Manaea, Daniel Gossett, and Jharel Cotton are all injury names that will have a shortened season, or if any season at all. Their younger arms are not quite ready to be called up, so it leaves a lot of average to below average arms starting in the rotation. Oakland also lost Trevor Cahill, and when he was healthy, Cahill was an excellent option. He is now in Los Angeles, so he didn’t move far. Oakland is simply in trouble, and there is really no quick fix for them right now. They will have to rely on the names in the current rotation, and hope for the best. Oakland overachieved with their rotation last season, owning the 11th best team ERA in baseball. This year is going to be tough to try and repeat that. Heading into the season, it looks like Mike Fiers is going to be their number one pitcher. Fiers flashed some potential, but overall is a league average right-hander that is not expected to carry a 3.56 ERA again. He is just the beginning of the A’s regression. Daniel Mengden is another regression candidate, who had a 4.05 ERA last season. He has below average strikeout stuff, and it will be tough for him to last long in most games with his inability to get guys out the second time through the order. Mengden would need to make a change to his arsenal and elevate some of his off-speed stuff if he wants to take another jump. If that does happen, he is an interesting name to keep an eye on. Frankie Montas has a blazing fastball, but not much more. He had some success last season, but also had some good luck, and teams trying to figure him out. He is expected to take a major drop in production when you compare seasons. Chris Bassitt pitched limited innings last season, and the A’s will rely on him a bit more with all the injuries. He isn’t the worst fourth or fifth starter, but the names around him just add to why we aren’t buying into the Oakland rotation this season.